Add a classic, stylish touch to your closet or wardrobe space with this White Decorative Drawer from ClosetMaid. The 10 in. H raised-panel laminate drawer features roller glides and fits with the ClosetMaid Selectives 16 in. tower unit. Perfect for undergarments or socks, the drawer offers smooth, full-extension operation that provides easy access to clothing, while the solid drawer bottom offers strength and sturdiness. 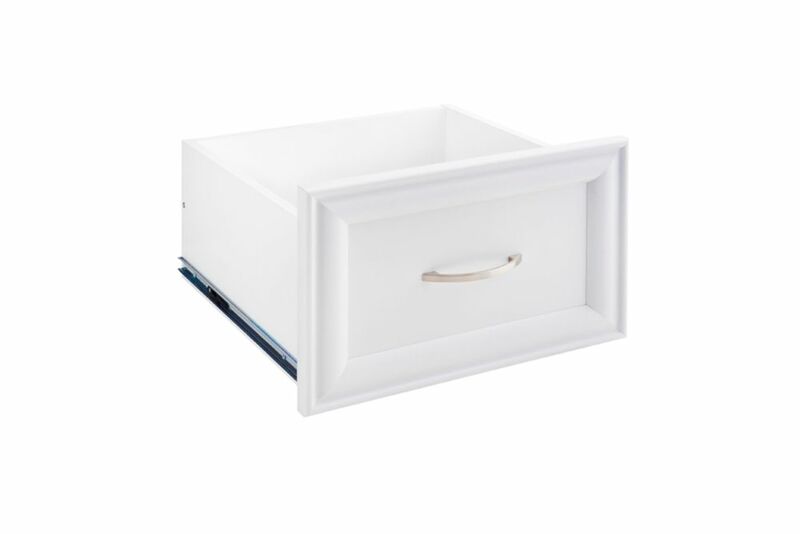 ClosetMaid Selectives Narrow 16in x 10in White Decorative Drawer Add a classic, stylish touch to your closet or wardrobe space with this White Decorative Drawer from ClosetMaid. The 10 in. H raised-panel laminate drawer features roller glides and fits with the ClosetMaid Selectives 16 in. tower unit. Perfect for undergarments or socks, the drawer offers smooth, full-extension operation that provides easy access to clothing, while the solid drawer bottom offers strength and sturdiness. ClosetMaid Selectives Narrow 16in x 10in White Decorative Drawer is rated 4.4 out of 5 by 66. Rated 4 out of 5 by Jerilyn from These drawers were easy to assemble and install into ClosetMaid... These drawers were easy to assemble and install into ClosetMaid closet system. Rated 5 out of 5 by Helmsman from This is a great addition to my closet organizer. Easy assembly and installation. This is a great addition to my closet organizer. Easy assembly and installation.